Master Blenders use whisky matured in refill American oak hogsheads, European oak Sherry casks and refill casks with new ends for this expression before allowing the resultant single malt whisky to marry in small oak casks. Oban Distillery takes its name from the town where the Highlands meet the Islands. Two brothers, the Stevensons settled here in 1778 and greatly enriched the hamlet, as it was then, with their business activities ranging from slate quarrying to shipbuilding. In 1794 Hugh Stevenson built the Oban Distillery, hiring an experienced Lowland distiller to manage the whole operation and distill oban single malt scotch. Nestling beneath the steep cliff that overlooks Oban, one of Scotland’s oldest sources of single malt whisky is but a stone’s throw from the sea. This coastal location is accurately reflected by the character of the Oban 14 year old single malt whisky. At Oban Distillery you can see the distillers at work crafting a rich, sweet malt whisky with a subtle hint of sea salt and peaty smokiness. Dark amber in color, Oban Little Bay has a rich and vibrant malty bouquet with dried apple, dried plums, caramel, honey, allspice, and oak. There’s a solid balance between the rich and spicy characteristics. The entry is very flavorful and expressive, matching the bouquet quite well with toasted malt, green apple, dried apricot, salt, chocolate, and orange peel. In the mid-palate the real impact of the small cask finish is quite apparent as the spice elements noticeably increase with clove and oak without abandoning the sweet dried fruit underneath. 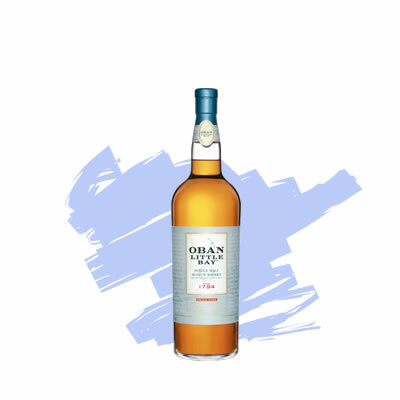 After the peak of the mid-palate, Oban Little Bay backs off quite a bit for a lightly acidic and slightly spicy finish. Contrary to popular belief, there is no right or wrong way to enjoy Single Malt Scotch Whisky. What’s important is that you enjoy the experience. However, there are certainly some ways that are better than others if you want to truly appreciate the flavours and aromas in a Single Malt.